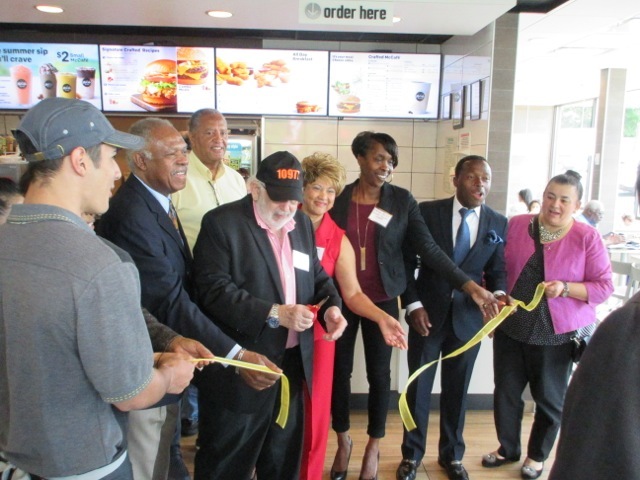 Spring Valley, NY McDonald’s Re-Grand Opening: Bernard Charles, Spring Valley Deputy Mayor; Alan Simon, Spring Valley Mayor; Nellie Thomas, Franchise Owner; Sherry McGill, Spring Valley Board Trustee Member. The Spring Valley McDonald’s held a ribbon curtting and grand reopening earlier this month, showcasing the fast food restaurant’s futuristic and customer-friendly new stylings. Longtime McDonald’s owners, Herb and Nellie Thomas, were joined by Spring Valley Mayor Alan Simon and other government officials and local dignitaries. The restaurant recently underwent several months of renovations and now includes new features like digital self-order, kiosks, table service, and mobile ordering—all wrapped up in a sleek new modern décor. The Thomas family has owned and operated area McDonald’s restaurants for 30 years. The Thomases said they are not alone; McDonald’s is trying to reinvent itself nationwide.